Unlike the Bongomaster, John Cady is a bit of a dab hand when it comes to using saws, screwdrivers, spanners and glue. So when I learnt that he had converted a Bongo from scratch, I commissioned him to write this Bongo Tale! When daughter Liz married Andy, it soon became clear that they were desperate to own a campervan, both being fans of the outdoor life, & watersports in particular. 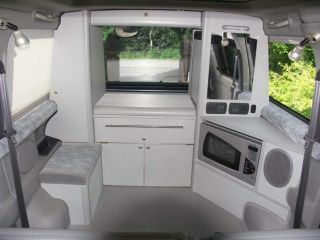 Being keen motorhomers ourselves, we were delighted to help by making the conversion a belated wedding present. Andy had visions of surfing cool VW campervans, & as I was retired with allegedly nothing better to do, I gladly volunteered to help find a suitable vehicle. My internet searching soon had me convinced that a Bongo based van represented far better value than a VW. Mind you, Andy took some convincing accepting a vehicle called a Bongo, or worse, a Freda! After a couple of visits to A1 Auctions at Southampton docks, we came away with a very smart ’97 4WD, 52,000 miler, with twin electronic A/C & twin batteries, for £4100. A further £125 indemnity, & £125 transport, saw the Bongo sat on my drive in the Midlands a few days later. A new mph speedo face off ebay was soon fitted, along with rewiring the offside reversing lamp with a high output LED bulb provided the rear fog lamp, & we sailed through the MOT with no problems. Next job was to build a simple unit across the rear in mdf painted grey, & fitted with sink/hob combo, fridge & storage. This was sufficient for the DVLA inspector to register the vehicle as a motorhome, thus avoiding the expense & time for SVA approval (motorhomes are exempt, although the rules have been tightened since I undertook this project). Next, I fitted 3M Thinsulate insulation behind side & door trims, & on the floor. The carpet & rear seats were discarded, & a 12mm ply floor mounted on 15mm spacer blocks, all glued with PU adhesive. B&Q silver grey checker plate vinyl finished the floor off a treat. My plan for the furniture was to use grey lightweight board from DecorLam, in conjunction with Reimo medium grey plastic profiles & edging. As the board is pretty expensive, a packaging mock-up was constructed first using cheap 15mm mdf. The mdf parts then formed the patterns for cutting the DecorLam. I was lucky to purchase a 40ltr Waeco fridge with separate compressor, £200 off at the Feb. NEC show. This allowed me to package the fridge with minimum intrusion, into the unit shown left above. Temporary mdf slaves were removed after sliding the whole unit into place, which was then bolted to the seat mounting studs atop the wheelarch. Note that plenty of ventilation holes provide air movement for the fridge compressor & microwave. Fuses, MCB/ELCB & mains/inverter selector switch were mounted on the back of this unit. A 1kw (2kw peak) inverter was mounted as shown by reversing the foot rest to give clearance. A battery master switch hidden under the trim panel requires the ignition key to be removed to operate the inverter. The Eberspacher blown air heater was mounted in the engine bay, whilst it’s control unit looked made to measure to fit the dash! Small LED rocker switches control house electrics via a 30A relay, & rear fog lamp. Storage features 2x10ltr water canisters, portapotti, large cutlery drawer, side & seat cupboards, microwave, & fridge, & the top locker houses a full set of dinnerware for 4. And via the tailgate, folding table, 904 gas cylinder, hook-up lead, pitch marker, bbq set, 2x folding chairs, stools, & levelling ramps, boot space under m/wave, & emergency kit. have a go! It is great fun, & deeply satisfying enjoying a campervan that you have built yourself.